You get an SMS and email one month before you need to schedule an inspection. How often should you conduct an inspection? Before the inspection, your tenants will receive a form asking them to list any maintenance issues. You don’t need to do anything else before the inspection once it’s been scheduled. How much notice should you give before an inspection? Once you get to your tenant’s home, you can start the inspection. Just open up the Cubbi platform, then click on the routine inspection that you scheduled. That will open the routine inspection form. The form only has 4 questions, including whether the tenants are taking care of the property, and if they need to do anything once the inspection is complete. Walk room to room with the Cubbi form open so you can write down any issues straight away. If you can’t attend the inspection you could outsource it. Once the inspection is done and you’ve written down any issues on the form, then just click through the form to finish it off. 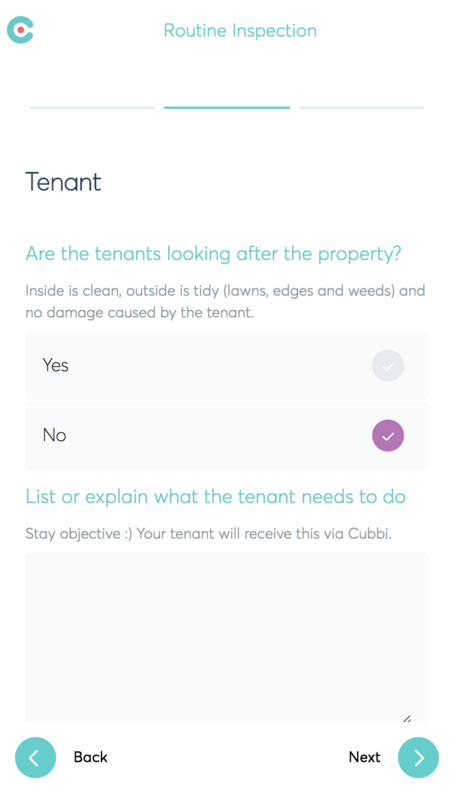 Your tenant will automatically receive a notification that the inspection is complete, along with your responses to keep everyone on the same page. Be sure to remember to fix any issues the tenants report in Cubbi or tell you at the inspection. After that, you’re all done – Cubbi will remind you a month before your next inspection to make sure you schedule it in time.